Judith Carnaby: Hi ladies! 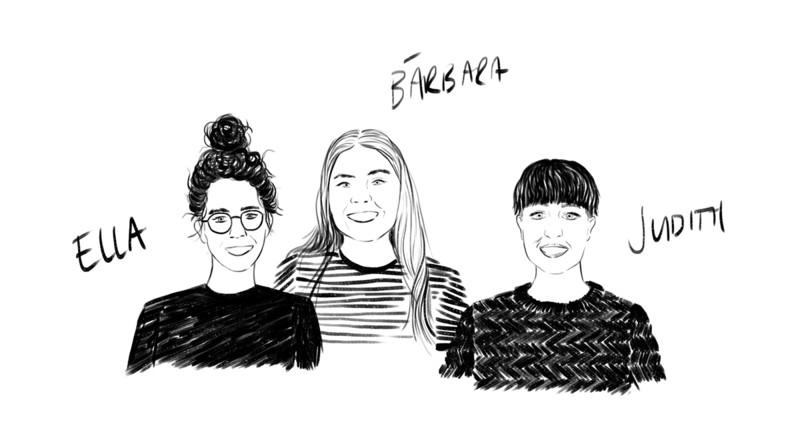 Bárbara, we’ve chatted quite a lot about illustration during your interview last year, but Ella, you are new to Illustrators Illustrated so perhaps we start with you. Most illustrators start with sketching out ideas as a way of generating ideas for a finished work. Is that something you find important in your process of creating work? Ella Cohen: It depends whether we are talking about commercial work or personal projects. For example with commercial editorials, you have to do sketches, offer more than one option, and don’t have much time. I try and make two to three ideas, as different from each other as possible. While I’m sketching I try to stylize some aspects and it’s a challenging and fast process. With personal projects it’s interesting just to start and ‘illustrate as you go’. It’s liberating when you are used to the process of first a pencil sketch, then colour. Now I’m in a phase where I want to try new things in a free way. It’s very refreshing. Bárbara Fonseca: With commercial work I also do a lot of sketches to try and present new ideas. I think that in itself is quite interesting. It’s also difficult not to do too much on a sketch, as sometimes you get excited with an idea and it’s hard not to just go with it. Although sketching should be a more free thing, it can also be an exercise in self control. Regarding personal projects, sketching is really important for the development of ideas. I like to do really quick stuff, because I think it is when you are yourself the most; there’s no filter. Judith: Do you think trying out different styles is important for developing your practice? As you said Ella, when you get used to one process of sketching then computer work, you also restrict yourself to one particular style because you know it’s a process that will work. But this can be limiting as you already know how it will look at the end. Ella: I find the style issue very tricky. It can be very important to have a routine way of working because for most illustrators who work in the industry, when they get approached by a client, the client already has expectations and it is important to be able to deliver that. But on the other hand, I think that the moment you lose interest in the process, the moment that it becomes too easy, then something is lost. That is something you can see in the artwork – it looks like it has been done in a more mechanical way. I don’t believe in the easy way. I try to explore colours, or style, or visual rules as much as I can because I don’t want to get bored, but that is mainly in personal work that gets seen by clients later on. Bárbara: Personal work is very important because you’re not restricted to what you have to deliver; you get to be a bit more free and really develop new styles. Often the things I get asked for the most are the works I made for personal projects, and then I use that style in a client’s project. But it doesn’t have to be a style thing, it can also be how you think of things. Maybe you are not innovative with your style, but you are thinking of things in a different way, or you are showing new perspectives. The style will follow the idea in the end. Ella: That is really true for concept illustrations, where your way of thinking meets your way of creating the visuals. This balance is is really important because time is very limited, and you have to be very coherent, visually and conceptually. Judith: It can be useful to create a unique style, but sometimes the ideas have to drive the work, and then style serves the idea. Ella: A good idea really helps the work to stand out. The internet has made it both incredible to be an illustrator and also very challenging, because how do you stand out? How do you distinguish yourself? Sometimes style is not enough. The works that really stick with you have an idea or a story. Illustration is also about storytelling and maybe that is forgotten by some young illustrators today. Many people are doing beautiful work graphically, but I miss the craft of storytelling in their work. Judith: Telling stories through images has such power. Ella, you just showed us a new book that you bought, ‘Inside the Rainbow: Russian Children’s Literature 1920-35: Beautiful Books, Terrible Times’. It is from a particular time when illustration and design was used as propaganda, when everything visual was political. Illustration has a huge role to play today too, but somehow doesn’t seem to have the same sense of urgency. Ella: Yes, this book records a time when ideas were pretty much everything. From the second you were born ideas meant more than bread and butter; they were the bread and butter! I wouldn’t have wanted to be an artist in that time, but at least some of these people really believed in what they were working towards. If you believe in what you are doing, then illustration or design work is your weapon, it is so strong. I’m thinking about today and wondering, what are the issues that are most important to us? What do we want to convey, or to bring to people’s attention? Illustration is such a powerful tool, and I don’t think I’m seeing enough work that is really bringing up these kinds of ideas. Bárbara: Perhaps it is important to think about our context of today. In the Western world we live in pretty comfortable times so we’re super lucky and privileged. We have the bread and butter, and much more. It can be hard to think, what do I have to struggle for? So we can ask where the ideas are, but for us it is a comfortable time. Maybe we don’t have the drive to fight for something that is bigger than us. Judith: I think there are a lot of issues for us to engage with. When we look back at our time, what would we see? Would we be shocked that people weren’t protesting things? For example, we are in the time of the internet, which means we have more access to information and knowledge than ever before, but we are also in a time of the most surveillance and privacy issues in history. Is it because these issues are not interfering in our daily lives, for example like our access to water, that they are less pressing concerns? Ella: It is something that we are almost happy to play along with. Judith: That is just one example, but I think there are still so many ongoing struggles, like women’s rights, like civil rights, that are not close to being resolved. So perhaps it is not about fighting against something new, but choosing to be vocal about ongoing issues that mean something to you. Ella: I was just working with a magazine that talks a lot about technology, and futuristic stuff that I know very little about. But this particular issue was dedicated to the NSA and privacy. It was really interesting for me because I made new pieces on a subject that I had never tackled before. It was also very hard to tackle these issues in a new graphic way. It will be really fascinating if we look at what is made today in 20 years from now, because eighty percent of editorial work will probably have a laptop! A laptop as a book, a laptop as a roof… It’s endless! And of course I am doing this as well because it is of now. Judith: Perhaps a problem is that the research we do is not deep enough. If you have three hours to research something, that restriction can mean you just scrape the surface of an idea or issue. With editorial illustration, for example, what is the process of research that you go through? Ella: I completely agree, and I think that sometimes reading too much on the subject is also not a good idea! Recently I had to do a piece for the New York Times about the way our visual memory works, and I had only one day to create the image. The writer referenced some very specific images from the book ‘The Great Gatsby’. This is an illustration trap! I was drawn to the author’s examples straight away, and I thought, ok, do some research. So I read the Wikipedia page, and I was just so obsessed with this opportunity to educate myself on a great book, that I completely forgot that it was not the time to learn about the Great Gatsby! It was my responsibility to convey the general idea of what happens to your visual memory when you listen to a book. 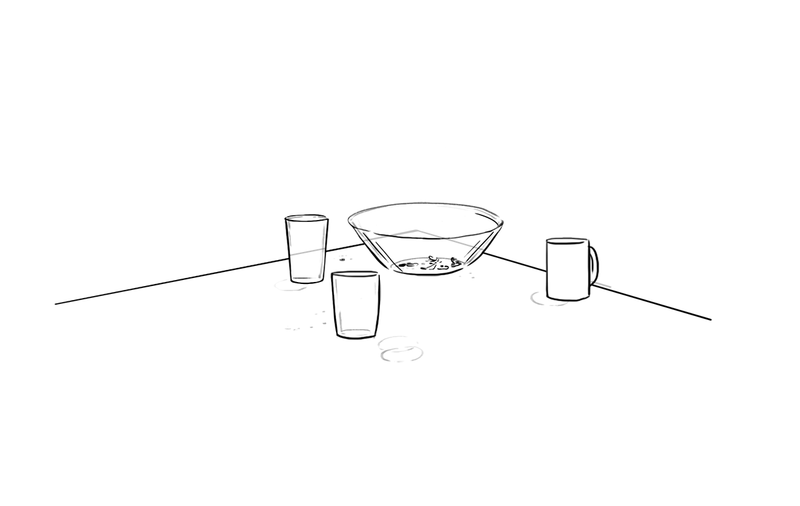 I ended up doing something completely different, but it took at least four or five sketches. The first three were completely rejected. But, I know that if I start sketching, the first sketches are awful. After getting through them you really start to work and start thinking in a more interesting way. Ella: You have to be very self disciplined. I think in every illustrator, or at least in every one I know, there is this little child that likes to draw, and is really excited every time she gets permission to do this thing that she loves the most. I feel lucky with every job that I get, and yet this is something that takes a lot of self discipline. Also hard work. Illustration is hard labour. I was just reading some interviews with Nick Cave about his new movie, and he said that good ideas are important, but they are overrated. So many people have great ideas, but at the end of the day the things that get done are the things that matter. And that requires a lot of hard labour. 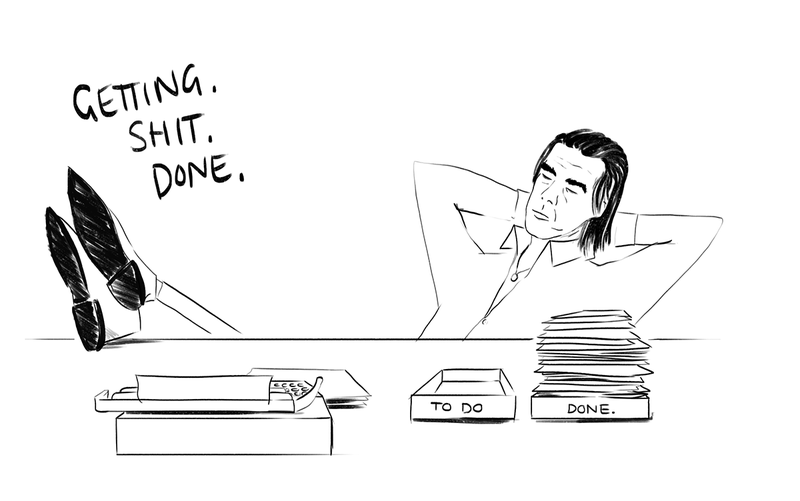 Bárbara: Nick Cave worked really hard. I read his biography, and I think Nick Cave is a very good reference for someone that actually worked. He was a drug addict and had a lot of problems, but still, he had to work. I think that’s true, you can have a lot of ideas, but what matters is what gets done, because it’s what you see. And he actually is someone who gets things done. 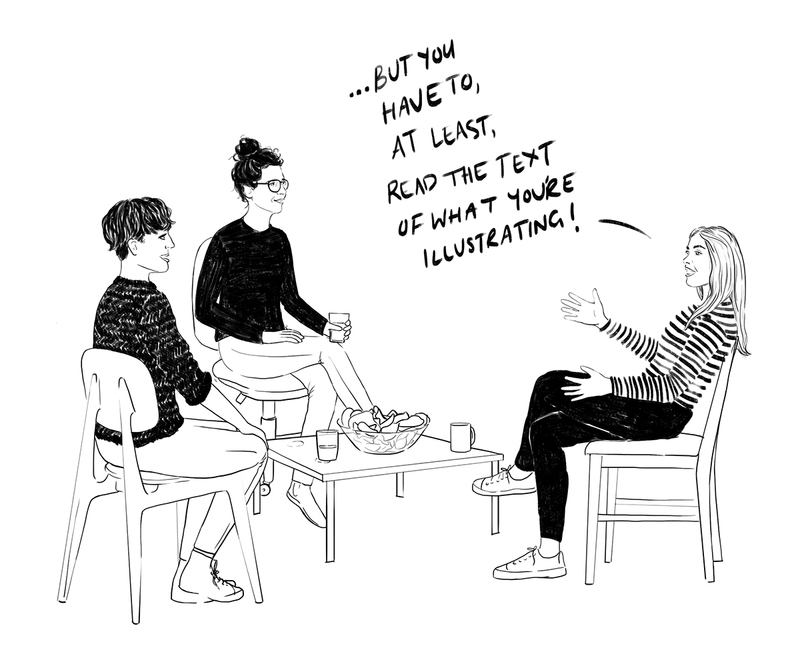 Judith: Illustrators are paid to be consistently creative, and that can be quite exhausting! How illustration works as a profession is interesting to think about, with the basic idea that you’re paid, in a short amount of time, to come up with something great. 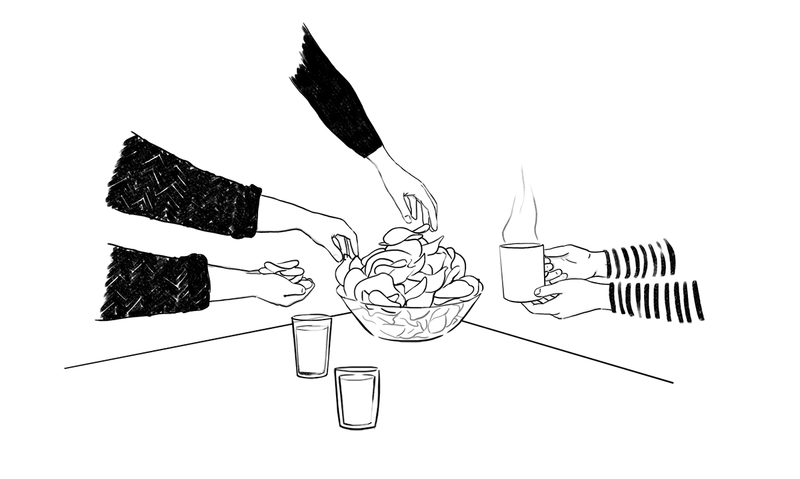 Bárbara: Illustration is weird in the way that it mixes a lot of professions. You’re an artist and you like to express yourself, but you are asked to adapt your thoughts and expressions to a bigger idea, because illustration serves a purpose, or text, or content. One important thing is to try and keep being inspired by things, because sometimes you can just be sucked in by work, and you don’t have time to be inspired. Ella: When you work in illustration as a profession, you are more that just an illustrator. Something that is not taught in art schools is the understanding that this is a profession, and to make a very clear separation between the artistic and technical parts of the business. It’s not enough just to be artistic, or to just deal well with public relations, or paying the taxes on time. I think it is the balance between the two that creates an interesting career. I’ve been working for four years now. It took me some time to understand that I am my own boss and that it is my responsibility to plan ahead, and to stay focused and alert. It is up to you as your own boss, to really steer the ship in the direction that interests you; to create your own work, but not just any kind of work. To know what interests you is really really important. Judith: I think this is a real challenge; trying to direct your career in a way that will enable you to maintain interest, expand your horizons and the ways that you learn and express yourself. It can takes years! Ella: Or one year if you’re lucky. But this is a muscle that you really have to work on. And then it gets better. It really does! Judith: Have either of you had a particular project or client that given you a moment of saying, this is an area that I am really interested in? Bárbara: I like to work as a team with the client; I like to tell them my ideas and I like to get feedback. For my last commission the clients understood the work I was doing, and were really clear with the specifications and deadlines. I was very happy to know there are people who know how to work clearly without stress! This should be the normal way of working with someone. Ella: We have all had our share challenging projects! But at the end of a day, it’s a job, and you have to deliver. For one of my latest projects, I got warning bells when I saw the words ‘slight adjustments’ in the brief, and it turned into a 2 week nightmare. Every time this happens it is something that shakes your confidence, no matter how many years go by. The project that really helped me figure out my path was one of the first ones I made, and it really made me understand how much I love being out and about, observing life, and that I find my inspiration in my surroundings. Reality can be so surreal sometimes; there are so many conflicts and nuances that it is just such good material to work with that you don’t need much else. Judith: Yes! But it really gave me something to think about and then try and communicate in a way that I hadn’t before. It is so nice to be able to observe something mundane and then to create joy from it. Or as we were talking about before, you can be political by observing something and taking a particular angle on it. There is a lot of space, when you work with everything. Ella: It’s basically endless! How to choose what to focus on is something I am dealing with lately. It is ok to choose based on your instincts and listen to yourself because after all this is something very emotional and some work comes from the deepest part of our being. Sometimes you just need to grab an idea without even rationalising it too much and just execute it, just do it. To see Ella’s work see her website. To see Bárbara’s work see her website. Coming up soon, check out Bárbara Fonseca’s portrait of Ella Cohen as part of the Illustrators Illustrated portrait chain!